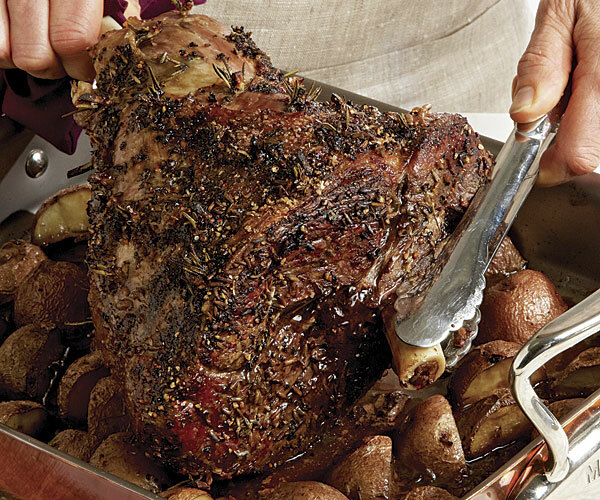 An overnight rest allows the Provençal blend of herbs and garlic that dot this leg of lamb to infuse the meat. Arranging the potatoes cut side down in a single layer beneath the lamb guarantees maximum caramelization. Pat the lamb dry with paper towels. With a small paring knife, make a deep slit through the fat layer on the roast and insert a sliver of garlic and a rosemary leaf cluster. Repeat every 2-inches over the fat layer, using all of the garlic and rosemary. Sprinkle the roast with the cracked pepper and lavender. Cover and refrigerate overnight. 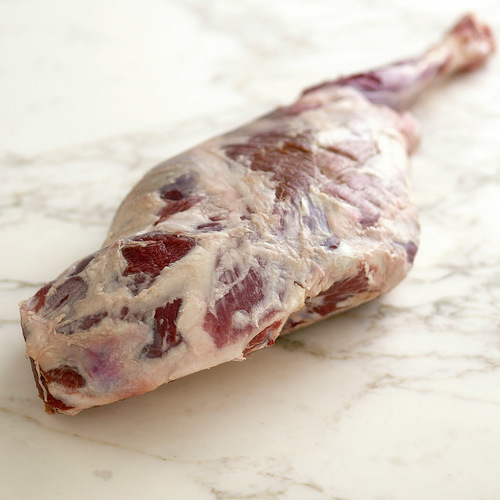 Remove the meat from the refrigerator and let sit at room temperature for 30 minutes before roasting. Meanwhile, position a rack in the center of the oven and heat the oven to 375°F. Toss the potatoes with the olive oil in a 10×15-inch (or similar) roasting pan until well coated. Season with salt and pepper and arrange cut side down in a single layer. Sprinkle the lamb all over with 1 Tbs. salt and set it on the potatoes. Roast until an instant-read thermometer inserted in the thickest part reaches 135°F for medium rare and the potatoes are tender when pierced with a fork, about 1-1/2 hours. Transfer the roast to a serving platter or carving board, cover loosely with foil, and let rest for 20 to 30 minutes. Keep the potatoes warm in the turned-off oven. Serve the roast whole or carved with the potatoes arranged around it. This was excellent. My teen daughter nearly licked her plate! I failed to prep the leg of lamb the day before so I did it in the morning. Instead of the rosemary sprigs, I followed the advice of an earlier reviewer and made a paste in the food processor with garlic, rosemary, salt, pepper, Dijon, and evoo. I cut the fat cap in a traditional crosshatch and smeared the paste all over it. I added carrots and parsnips in with the potatoes and roasted as directed. Served with a green salad and Oregon Pinot Noir. Really easy and worthy of a special occasion. I used a 4 Lb semi-boneless leg. Inserted the Garlic slivers. Slathered Dijon Mustard and Olive Oil over the entire leg. Made a Herb rub with Rosemary, Sage ,Oregano, Onion Powder and fresh ground Black Pepper. Coated the entire leg and set in fridge overnight. Sliced potatoes into 1/2" rounds with Olive Oil, fresh Pepper and a handful of fresh Parsley. Roasted the Lamb for about 1 3/4 Hours. The potatoes were infused with the delightful flavors of the rub and Lamb. Wonderful. Enjoyed with French Syrah wine. I decided just this morning to make this for dinner tonight. I didn't have "overnight" at my disposal, but the flavors of garlic and rosemary still permeated the meat beautifully. 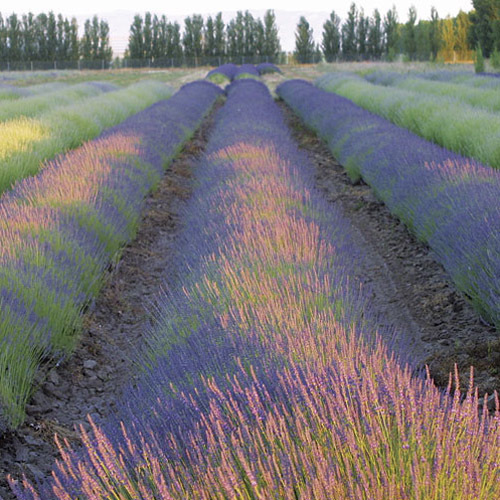 I also didn't have lavender so I substituted Herbs de Provence. This is one delicious lamb recipe. And the potatoes are killer! This was so good...the garlic, rosemary, and lavender blended together with the lamb perfectly. I cut off all the fat first, rubbed the lamb with olive oil, and then added the garlic and rosemary. 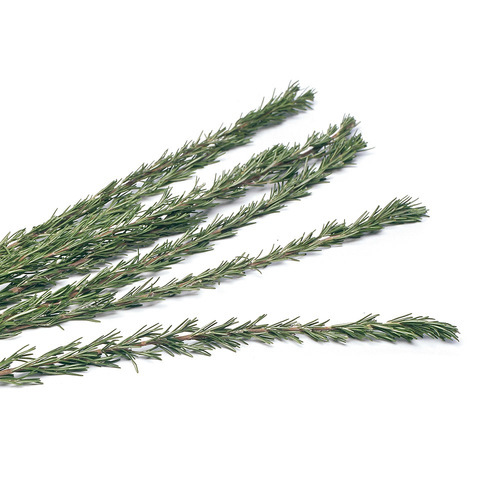 I covered it with additional garlic and rosemary, and fresh lavender. My guests loved it!